Wilderness survival kits can provide you with just the right amount of tools and supplies to make it through a challenging outdoor experience. The items you choose to carry can vary widely depending on your skill level, the environment you will be traveling in, as well as the time of year. Nothing can replace the value of basic survival training. Having a knowledge of natural shelter-building, friction fires, water purification, and common wild edible plants can go a long way. 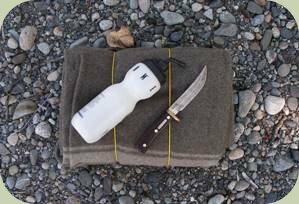 The photo below illustrates three of our top ten picks for core items to consider including in basic wilderness survival kits. Knife: The most important outdoor survival tool is a sturdy knife. Non-folding knives with three inch blades are extremely versatile. Knives can be used to build friction fire-making kits, gather shelter materials, and harvest wild edibles. Water Purification: Purifying water primitively can be very time consuming. A good water filtering bottle or pump filter can save lots of energy, providing one of the most important survival needs - clean drinking water. Wool Blanket: Even the best natural shelters can be quite cold. A simple wool blanket can add enough extra warmth to make the difference between being too cold to sleep versus getting a good night's rest. It also insulates when wet. Lighter: A lighter can allow you to start fire efficiently. A good fire allows you to purify water, cook food, and warm a shelter. Matches: Matches provide a back-up to your lighter. Lighters can malfunction or run out of fuel. Its prudent to carry more than one fire-making tool. Compass: Even with excellent aidless navigation skills, an overcast or foggy day can make orienting extremely difficult. A compass can point you in the right direction. First Aid Supplies: Injuries are common in the backcountry, and without treatment small wounds can become very debilitating. Always carry first aid supplies. Flashlight: In a survival situation, night often falls before you've completed a shelter and collected enough firewood. A flashlight helps you wrap up those last important details and can signal for help. Small Mess Kit Bowl: A metal bowl can be used to collect and purify water, as well as cook wild edibles. It also makes for a handy container to hold the smaller items in your outdoor survival kit. Parachute Cord: Parachute cord can be used as part of a bow-drill friction fire-making kit, and can also help in shelter construction and a variety of other needs. These items provide an excellent foundation for practical outdoor survival kits. There are many additional items that can be included depending on your location, skill level, and time of year. Survival kits are handy, but what if you left home without one? Participants in the Alderleaf Wilderness Certification Program learn the skills needed to survive without the aid of survival kits.